Constitution Art. 1 Name. This society shall be known as the Cary Club of Marion Iowa. Art. 2 Object. It shall be the object of this society by a careful study of the [different?] authors, places, and topics to secure to its individual members a higher cultivation of mind and a more general knowledge of literature. Art. 3 Membership. The [members/numbers] of this society shall be limited to [twelve]. Art. 4 Official. 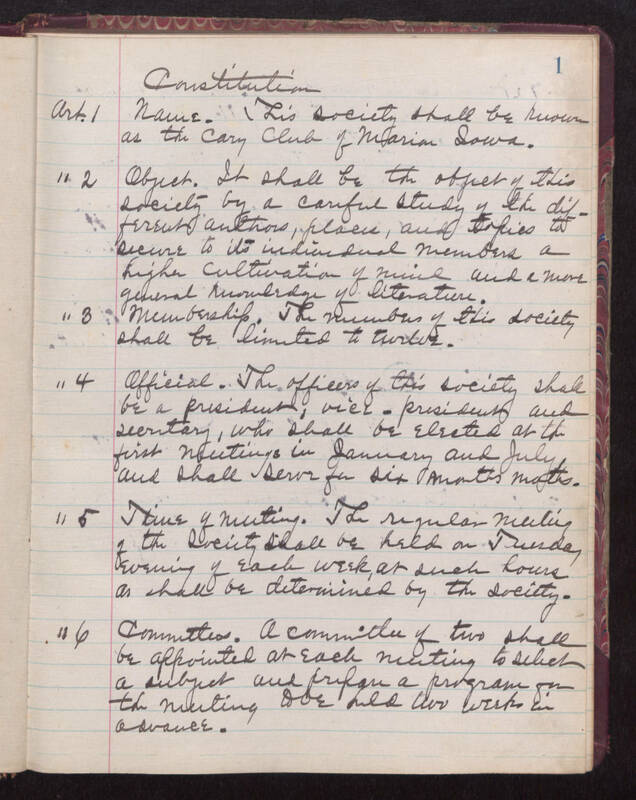 The officers of this society shall be a president, vice-president and secretary, who shall be elected at the first meetings in January and July, and shall serve for six [illegible] [months?]. Art. 5 Time of meeting. The regular meeting of the society shall be held on Tuesday evening of each week, or such hours as shall be determined by the society. Art. 6 Committees. A committee of two shall be appointed at each meeting to select a subject and prepare a program for the meeting to be held two weeks in advance.